It’s been a long time since Microsoft first announced native support for VR headsets – made by partners like Dell, Asus, and HP – in Windows. Nearly a year later, those headsets are finally ready to ship, along with the fancy new VR controllers revealed in May. The key difference between Microsoft headsets and existing options like the Oculus Rift and Vive is that Microsoft’s solution doesn’t require external cameras. The company is using the technology it developed for HoloLens to map a playable area using just the sensors on the headset itself. I had the chance to play with both the new headset and controllers, and, well, they work. The controllers light up like a handheld LED disco ball, and the headsets were able to track my position without a hitch through several game. Windows Mixed Reality settings from Lenovo[index company=lenovo], Acer, Dell, and HP (left to right). I can’t say whether it’s better or worse than Oculus’ or HTC’s implementation without more testing, but it’s notable I didn’t immediately spot a difference. It’s possible the controlled setting I tested it in isn’t representative of the experience in the average (messy) room. And the image from the headset isn’t quite as high quality as I’ve seen on Oculus and Vive . But the experience strikes me as ‘good enough,’ and for the masses, that will suffice. Windows Mixed reality headset+controller bundles start at $400. Deals aside, the equivalent Oculus bundle is $500, while Vive is $600. Microsoft will likely have a greater variety of headsets ranging from inexpensive to premium. 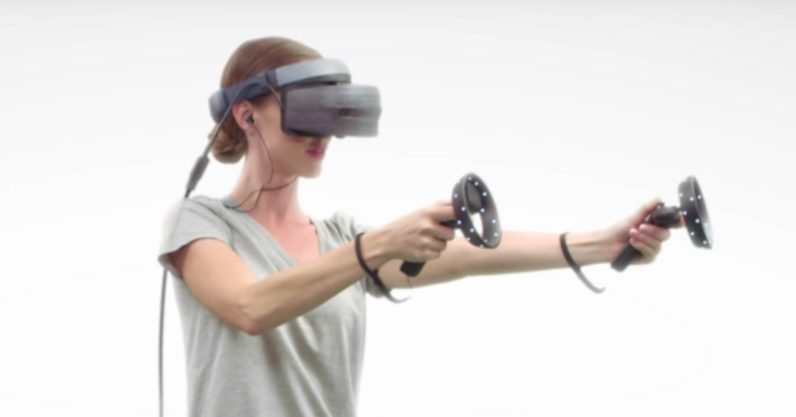 You don’t need to deal with cumbersome external camera arrangements and extra cables to get six degrees of freedom (being able to move your head and body around within the virtual space). The spec requirements are much lower – the experience can run on integrated graphics, even if some titles will run at lower frame rates. To expand on that last point, Microsoft is dividing its Mixed Reality experiences into two categories separated by quality. Computers marketed as “Windows Mixed Reality PCs” have integrated graphics and will run at 60fps, while “Windows Mixed Reality Ultra PCs” will have discrete graphics and run at 90fps. I tried the Mixed Reality experience on both a system with dedicated graphics and one with integrated graphics, and was surprised by how close the experiences were. Of course, it won’t be the same for graphically intensive experiences, but the six degrees of freedom helps avoid the queasiness one might experience on most systems with lower framerates. To help get things started, Microsoft is announcing that Steam VR titles will run on Windows Mixed Reality headsets, which basically opens them up to a wealth of existing titles. But while Microsoft is starting off with games the end-goal is making mixed reality headsets as integral to the computing experience as a monitor. Making high-quality VR cheaper and easier to use is a good start.